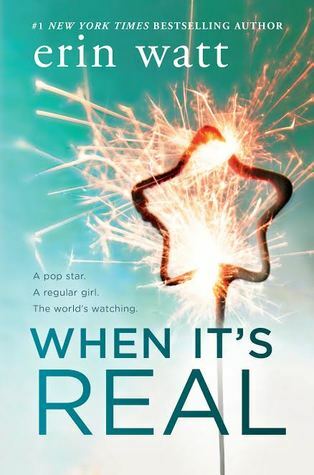 From #1 New York Times bestselling author duo Erin Watt comes the addictive contemporary tale of a teen rock star in need of an image makeover and the teen girl hired to be his fake girlfriend. (Published May 30th 2017 by Harlequin Teen) Meet Oakley Ford-teen celebrity, renowned pop star, child of famous movie stars, hottie with millions of fangirls… and restless troublemaker. On the surface he has it all, but with his home life disintegrating, his music well suddenly running dry, and the tabloids having a field day over his outrageous exploits, Oakley’s team decides it’s time for an intervention. The result: an image overhaul, complete with a fake girlfriend meant to show the world he’s settled down. My thoughts: When It’s Real is an unbelievable book about first love, family, friendships, second chances, and following your dreams. Watt has created a story that is realistic and dream filled combined into one amazing story. The characters are written so well with complicated backstories that make them believable and real. You will feel as if they are your friends while you read page after page of teenage drama. What really makes this book standout is the connection of between being a teenager and still facing adult problems well beyond your age. Everyone at some point dreams of being sweep off their feet by a rock/pop star. When Vaughn is approached with an offer to be the fake girlfriend of Oakley Ford she is not sure at first because after all she has a boyfriend. However, when giving the opportunity to make a large amount of money from the one year contract she has not choice but to accept. Her parents died a few years back in a car crash leaving Vaughn and her sister to provide for their two younger brothers. This opportunity comes at a time when the insurance money is running out and both girls are working full time jobs to try to stay afloat. At first, Vaughn and Oakley do not hit it off. They almost hate each other but slowly the more time they spend together they become friends. Will this friendship become more? You will have to read to find out! Overall, I highly recommend this book to anyone who loves a young adult novel with a touch of romance.